Google has launched person finder to help locate missing people in Kerala flood. The US search giant announced its initiative in a Twitter post. The death toll in the Kerala floods has risen to 114, news agency IANS has said. “Twenty-three more helicopters will join rescue operations tomorrow. 200 more boats will also be part of it. Those who are stranded will be relocated to safer zones from tomorrow morning,” Kerala CMO tweeted. Airlines have waived off rescheduling and cancellation charges on tickets to flood affected Kerala after flight safety watchdog Directorate General of Civil Aviation (DGCA) highlighted the hardships faced by passengers. Latest updates on Kerala floods showed that Ernakulam is now under water. Water level of the Periyar river has surged dangerously. CM Pinarayi Vijayan will again meet the press at 8.45 pm. The Centre decided to send 35 more NDRF teams comprising nearly 1,000 personnel to shore up relief and rescue operations. After the meeting of the National Crisis Management Committee early in the day, the government initially directed sending 12 fresh teams of the federal disaster contingency force to the state and later decided to airlift 23 more teams in order to scale up the operations.“The first 12 teams will reach Kerala by this evening. The rest 23 teams are being sent gradually. The teams have been equipped for assisting the state government authorities in launching quick relief, rescue, medical aid and food distribution tasks in both day time and at night,” NDRF Director General Sanjay Kumar told PTI. The Coast Guard has rescued 60 stranded people, including women and children, from Puthenvelikkara and Thonal Palam in Ernakulam district and moved them to safety at Kadavu station.Hundred people, including senior citizens from an old age home,have been rescued from Companypady in Aluva and shifted to shelters at safer places. Kochi Metro resumed its operations at 4 pm. “All of Kochi Metro’s resources will be used to assist rescue missions and hence the services will be free of charge for the day,” it tweeted. Konkan Railway on Thursday cancelled five trains from Kerala, a spokesperson said. The cancelled trains are train no. 12202 KCVL-LTT Garib Rath, train no.16346 TVC-LTT Netravati Express, train no.12617 ERS-LTT Mangala Express, train no. 19424 TEN-GIMB Humsafar Express and train no. 22114 KCVL-LTT Express for 16 August. Tamil Nadu CM Palaniswami alleges that his state officials were not being permitted to gauge the rainfall in the catchment area of Mullaperiyar dam in Kerala and urged the neighbouring state to share rainfall data on a real-time basis.In his letter to Kerala CM Pinarayi Vijayan, Palaniswami said that the Tamil Nadu Water Resources Department is managing and regulating water releases from the Mullaperiyar dam as per the inflow rate. He assured Vijayan that the dam is safe—hydrologically, seismically and structurally. In a significant move, Kerala hiked the liquor tax to raise ₹ 230 crore for the flood relief fund. Kerala finance minister Thomas Issac announced the move on Twitter.“Yes. There is financial resource crunch. We shall overcome. As additional resource mobilisation to Chief Ministers Disaster Relief Management Fund, excise duty on liquor increased by 0.5 to 3.5% for a period of 100 days. ₹ 230 crore expected as additional revenue,” Isaac tweeted. The Indian Navy has commenced airlift operations on Trichur, Aluva and Muvattupuzha areas. Thirty-six people have been rescued and sheltered at the Kochi naval base. Food and water also being planned to be dropped. As many as 132 people have been rescued from Thrissur, Aluva and Perumbavoor by Coast Guard helicopters today. An elderly woman is rescued in a cooking utensil after her home was flooded in Thrissur, Kerala, today. 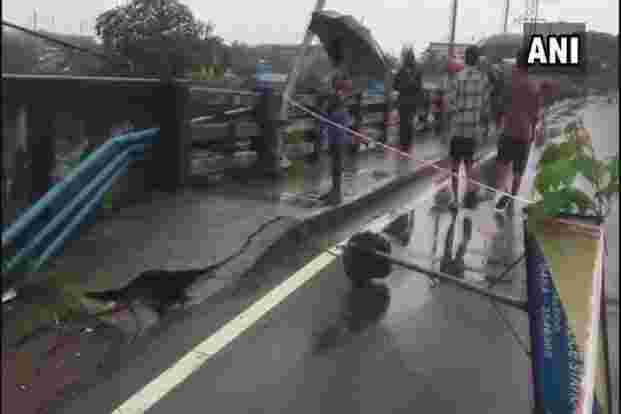 Torrential monsoon rains have disrupted air and train services in Kerala, where flooding, landslides and bridge collapses have killed dozens of people in the past week, officials said. Indian fire and rescue personnel evacuate local residents in an boat flooded following monsoon rains at Aluva, Kerala, on Thursday. 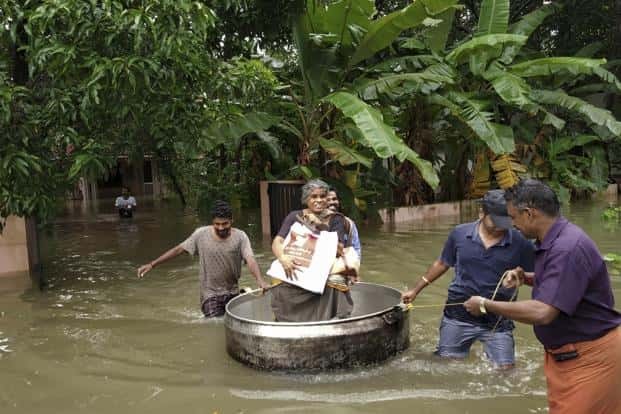 The death toll from Kerala floods increased to 77 on 16 August, as torrential rainfall threatened new areas, officials told AFP. Kerala opposition leader Ramesh Chennithala sent a letter to the Prime Minister Narendra Modi urging him to visit flood-hit area of the state. Supreme Court today asked the high power committee to convene a meeting by tomorrow morning in connection with the rising water level in Mullaperiyar Dam in Kerala. The flood-affected people who are being airlifted are being housed at Aircraft Hangar, INS Garuda in Kochi. The Supreme Court today termed as grave the flood situation in Kerala and asked the states and Centre not to treat the issue as “adversarial. The apex court will also hear today itself a plea seeking Centre’s intervention to mediate between Kerala and Tamil Nadu on issue of rising water in the Mullaperiyar Dam. The Indian Navy has started “Operation Madad” (help) for Kerala floods relief. It has tweeted out an update on where its teams are in Kerala as of 2pm today. 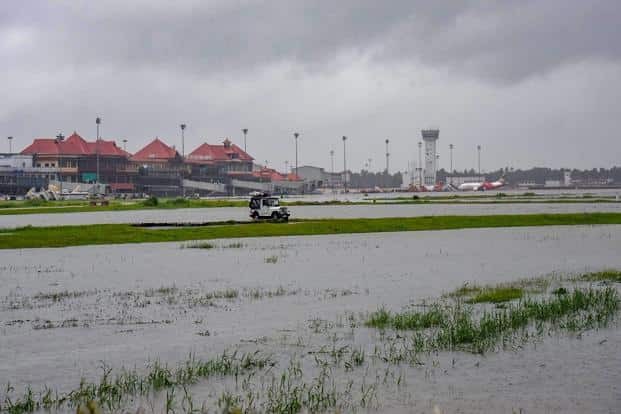 Water levels inside the Kochi airport has been rising due to the Kerala floods, the DGCA said today. Flood water has spread across Kochi in Kalamassery region. Roads damaged and water continues to flow inside the city. Visuals from a relief centre set up in Kumily, Idukki, after flood waters entered villages in the area. Congress president Rahul Gandhi tweeted that he has requested PM Narendra Modi to massively increase deployment of the army and the navy to mitigate the Kerala flood crisis. “I also said it is critical that he give the state special financial assistance as this is a tragedy without parallel in Kerala’s history,” Gandhi tweeted. 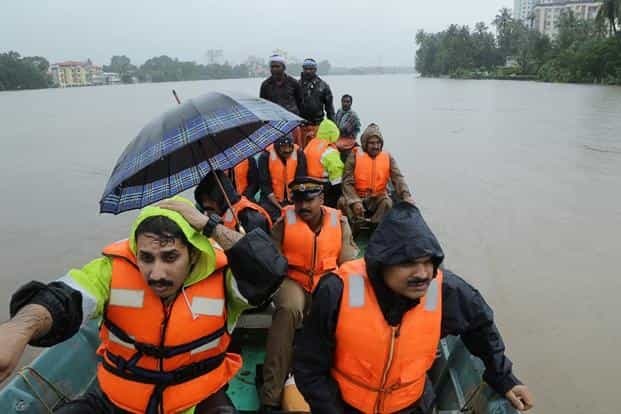 Further augmenting its rescue and relief efforts for the Kerala floods, the Coast Guard has mobilized the available resources and deployed six teams with Gemini boats in the flood-hit areas of Ernakulam, the defence ministry has said. Floating devices, lifeboats and life jackets will be airdropped to stranded groups of 50 or more people, says Kerala CM Pinarayi Vijayan in a tweet. A control room has been set up at DGCA headquarters in New Delhi, which is being manned since Wednesday night to address the issues after suspension of flight operations to and from Kochi airport—shut due to Kerala floods. “Twelve districts are severely affected by the Kerala floods. These are the worst floods since 1924,” said union tourism minister K.J. Alphons today. “I met the prime minister, home minister and the defence minister yesterday. The Army, Navy, Air Force, Coast Guard and the NDRF are conducting rescue and relief operations. It is predicted that water levels will rise” he added. Indo-Tibetan Border Police conducts rescue operation in Thrissur district’s Arattupuzha village. CM Pinarayi Vijayan will brief the media on Kerala floods at 12 noon, even as opposition leader Ramesh Chennithala is visiting flood-hit areas. He wants the army to be given full control of the situation. More army personnel have reached from Pune and Bhopal. 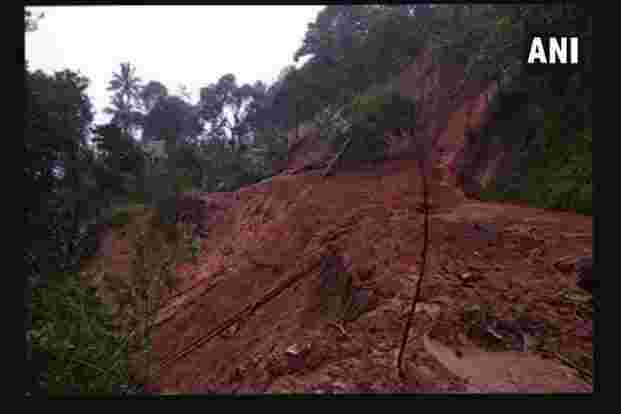 The Pathanamthitta district in central Kerala has been the worst affected by the floods in the last 24 hours. 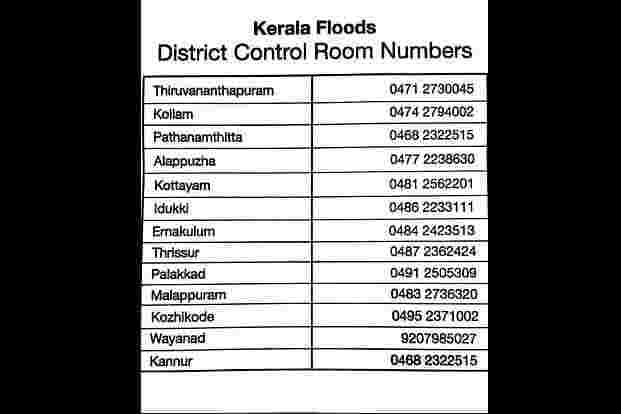 Here’s a list of the Kerala flood helpline numbers in various districts of the state. The state government has opened control rooms to tackle the Kerala floods. The Indian Army and National Disaster Response Force has pressed more teams into service. The helpline numbers, however, are jammed and several people are unable reach authorities.“Helpline numbers not working, need more assistance from the govt. Situation so grim that even relief camps are flooded. In Aluva’s Kondotty, a masjid acting as a relief camp has more than knee-high water. We need more boats urgently,” said Aluva MLA Anvar Sadath to Manorama News channel.CM Pinarayi Vijayan called for an emergency meeting of top officials on Thursday morning, and phoned Rajnath Singh requesting more central forces. Nidheesh M.K. Cabinet secretary P.K. Sinha is leading a meeting of the The Crisis Management Group Committee at the union home ministry on Kerala floods. Visuals from Trivandrum’s Shanghumugham beach amid incessant Kerala rains. Union tourism minister and former Kerala MLA Alphons Kannanthanam met the prime minister, home minister, defence minister and finance minister yesterday to discuss the Kerala floods. He would be travelling to Trivandrum today and will meet all concerned for any coordination. Vistara is operating special flights to Trivandrum in view of the Kochi airport closure. Flights will operate from Delhi and Chennai. The economy class fares will be capped at ₹ 10,000 and ₹ 7,500, respectively, one way. 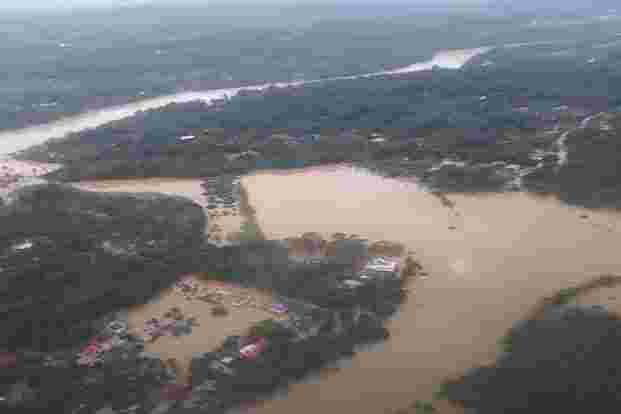 The Directorate General of Civil Aviation (DGCA) has advised airlines to operate relief flights to flood affected Kerala and not to overprice air tickets. Home minister Rajnath Singh once again spoke with CM Pinarayi Vijayan on the prevailing Kerala flood situation. “The Centre is rushing additional NDRF teams to Kerala. We are providing all possible assistance. I’m in constant touch with Kerala chief minister,” said Singh. Several areas of Chengannur are waterlogged due to the Kerala floods. The Indian Army has built a 35 foot-long bridge and rescued about 100 people, including children and senior citizens, from Malampuzha’s Valiyakadu village. Prime Minister Narendra Modi has again spoken with CM Pinarayi Vijayan regarding the Kerala flood situation. Modi tweeted that he has asked the defence ministry to further step up the rescue and relief operations across the state. “Praying for the safety and well-being of the people of Kerala,” Modi said. Visuals of waterlogging in parts of Kochi. The metro train services in the city were suspended as water level rises in Muttom Metro yard area.